I sent a birthday card to a friend at camp. 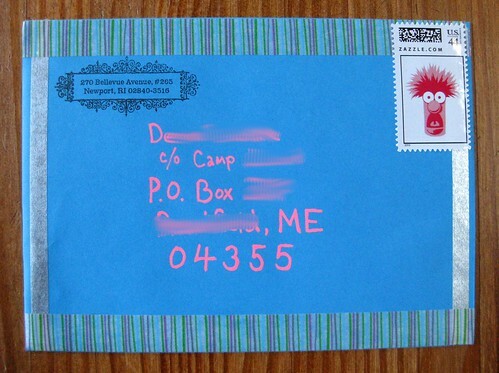 I wanted to make sure the envelope was nice and bright and cheery. It was fun to decorate. I save these Beaker muppet stamps for special occasions, of course. Are you wondering about that BRIGHT pink ink? I would be. I am loving it - it comes from my new Sakura Gelly Roll Moonlight gel ink pen from JetPens. They call this color "fluorescent vermilion orange" but it looks more pink to me. I guess it depends on the light. Anyway, it POPS off of both dark and light colors, and I believe it's waterproof. Apparently it glows under a black light, too, and best of all, it dries pretty quickly. I bought this pen in red, too, and now I'm considering getting a lot more colors. They write really well on postcards, and always look really bright. I realize I didn't take any photos of the pen itself, but let's consider this a mini-review: I love this pen and highly recommend it. That Beaker stamp is amazing! He's my all-time favourite muppet! Funny, I bought a "Coral" gel pen from JetPens a few weeks ago and it also turned out to be a bright pink. Still looking for a nice coral--now I know not to try this one! Though the pen itself sounds good. Eliza - NO, I hadn't heard! Bob Slate is coming back?? TELL ME MORE!!! Yes, it was just announced on Monday on www.bobslate.com. It'll be at 30 Brattle St in Harvard Square. Apparently the sign is already up! Oh wow. I just went to the website, too - 30 Brattle Street is where Wordsworth Books used to be, for those who have known Harvard Square for quite a while. Great location, great space. HOORAY! HOORAY! HOORAY!